Healthy Living Challenge Roundup: Reflection, Feedback, and Moving Forward! This is the roundup for the 14-Day Healthy Living Challenge where hundreds of participants around the world work together to improve on their diet and fitness in January 2015. The challenge is now over, but you can do the tasks in your own time. Visit the overview page for all tasks and posts. Announcement and signup page: Join 14-Day Healthy Living Challenge! 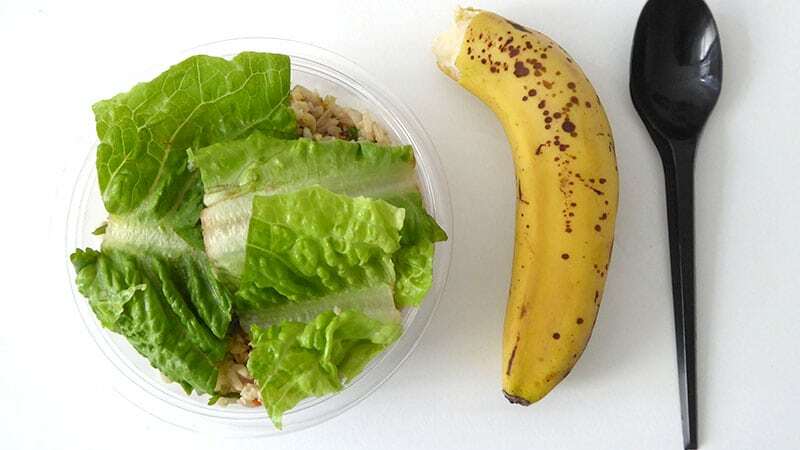 First meal of the day: Rice salad and banana before a coaching call! Had a terrific coaching call with one of my clients today and so excited about what’s next for her and her business (incidentally she’s starting a coaching and blog business as well). 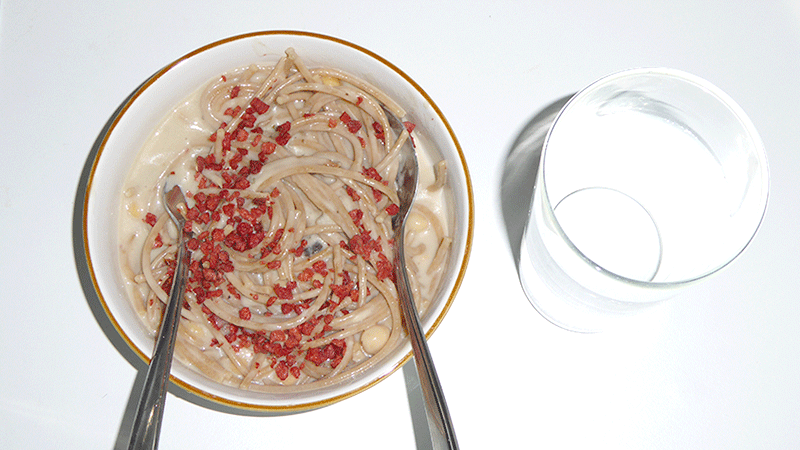 Dinner: Same wholemeal pasta as yesterday, made by myself! ^_^ With mushroom sauce, chickpeas, and bacon bits. 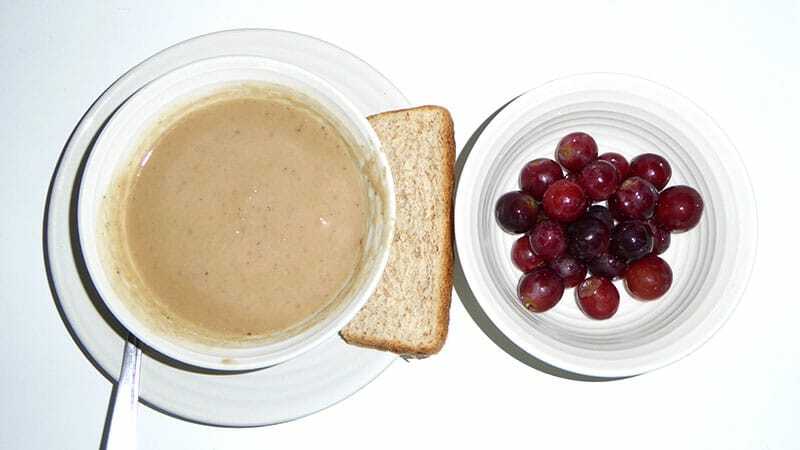 Snack: Apple and guava soup (same as Day 13’s) with wholemeal bread and grapes. Very tasty. My third exercise for week 3! Morning jog of 2.62km at 8:07 min / km, burning 175 calories. In total I had two salads on Day 14! That’s great! I guess my first salad of the day really counts as my salad for Day 13, since I fell asleep earlier than planned. Exercise at least three times a week – Check! Cut out deep fried / oily food from my diet – Check! 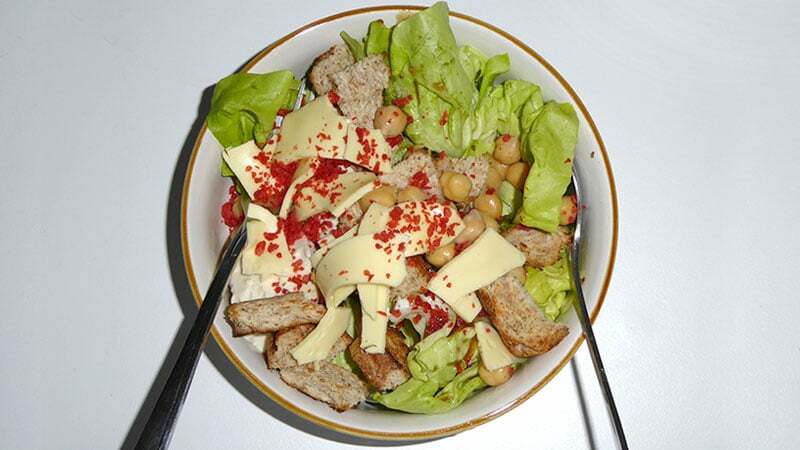 Eat salads more regularly, ideally once a day if I can – Check! Check out other participants’ amazing food logs and progress updates in Day 14’s comments section! So this is it! After two weeks of healthy living, posting pictures and updates of our meals/exercises every day, and doing the daily tasks, the Healthy Living Challenge has finally come to an end. For me, it has been a very eventful journey. Before the challenge started, my eating habits have been fairly good, as I’ve already been working on healthy eating since 2007. With this challenge, my plan was to take things up a notch by cutting out fried/oily food (for those of you in Singapore, think typical hawker food and a lot of the traditional Chinese/Malay/Indian food here, not to mention fries and chips), exercise three times a week, and eat a salad more regularly, ideally once a day if possible. It has been a blast. I’m excited and proud to share that I’ve met all my targets, and in the process busted the previous barriers that were preventing me from adhering to my plan. 😀 An overview sheet of my previous barriers and how I’ve effectively busted them during the 14HLC, below. My environment simply doesn’t cater to healthy living. The default food in my neighborhood (or in most shopping malls in Singapore really) tends to be fried/oily food. I wasn’t eating sufficient calories on my usual healthy meals. This was why I would sometimes eat oily/fried food because it was a fast way to load up my calories and meet my TDEE for the day! This was an AHA for me doing Day 3 and 4’s tasks, which I’ve shared here. My husband eats not-so-healthy food, but this doesn’t bother me at all. He’s free to eat whatever he likes; I encourage to eat healthily for his own good but his eating doesn’t bother or affect me in my own diet/living plans. The only times I feel like eating his food (say fries, fried rice, chips, refined noodles) is when my TDEE is not met for the day / I did not eat sufficiently, which leads back to reason #2 as opposed to it being anything to do with him. So it’s more to do with me than him. For the few months leading up to 2015 I wasn’t exercising much if at all, mainly due to my husband’s knee injury which I shared in Day 12’s post). There’s the expectation that we should exercise together since we’ve been exercising together all this while, so when he got his injury, I subconsciously felt that I shouldn’t exercise too, which was a self-limiting thought. The other reason was simply being busy with work and hence putting off my workouts. When done a few times, it subsequently becomes a habit to skip exercises. The nearest salad bar to my home is 40 minutes away (one way; so almost 1.5 hours both ways). Hence, I couldn’t eat salads as often as I wanted, especially during busy times. Goal #1: Cut out fried/oily food. Realize that in opting for a healthier diet than most people in the society, I naturally need to take actions atypical from most people. This means pre-planning for my meals, identifying the places that sell healthier food, and making an effort to get my food for those places. Also, being ready to cook sometimes will help address situations when my house is out of food. Stock up on healthy food. I’ve been doing this throughout the challenge. Now, I always stock up two days’ worth of healthy food, namely fruits, sandwiches, soups, and salads. Ensure I consume sufficient calories to match my TDEE on my healthy meals. This includes including healthy calorie-dense foods like avocado (I’m planning to get this in my next grocery trip) and eating small meals more frequently. Goal #2: Exercise three times a week. Scheduling my jogs into my calendar so they don’t get missed. I have a three-times-a-weekly exercise appointment with myself. 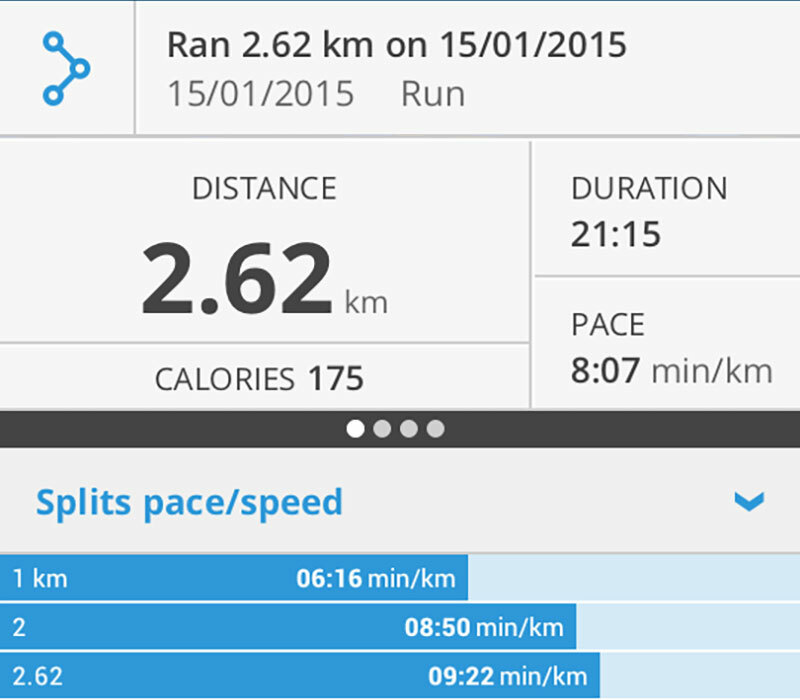 For my jogs, I make a point to run at least 2.4 km. By keeping my jogs no more than 30 minutes long, it’s easy for me to just wear my gear and go downstairs and run, then come back and shower (time boxing). Going grocery shopping every Friday to get my fruits/vegetable supplies. I do this every Friday with my husband. And we recently realized there’s a 24 h supermarket 10 minutes away from our home, so it’s the perfect place for nighttime shopping! I’ll be refining this as I go along, but it reflects the things I’ve been doing before and want to continue, as well as new guidelines I created for myself while doing the challenge. I think my biggest realization from this challenge is that the more you want something that’s not orthodox, the more effort you have to make (initially) to make it happen. It’s the same for anything, really — if you want an out-of-the-world life partner whom you’re head-over-heels in love with, then you’ve to spend more time (and effort) in your search for your soulmate. This means not settling, working on yourself, and working on attracting your soulmate into your life. If you want a terrific career/business that you love, this means spending the time/effort to make this career/business happen, and this isn’t going to happen overnight either. Likewise, if you want a pristine diet that’s healthy and reflective of your personal needs and beliefs, and if society / your environment doesn’t support this at the moment, then you’ve to make the effort to make this lifestyle happen. Realizing this has helped me to manage my expectations and hence seamlessly ease into my healthy living plans. Before 14HLC, I often felt disgruntled about how difficult it is to get healthy. However, now I know that it’s simply because my diet and lifestyle of choice is one that’s not typical of most people and the society, and that’s why my environment doesn’t support it. If I want to make my version of healthy living happen, I’ve to put in my due effort to make it happen. And that’s what I’ve been doing in the past two weeks of the challenge, and what I’ll continue to do moving ahead. The great thing is that like every new habit, the bulk of the work is done at the beginning to transit to the new habit. When the roots have been cleared and new structures are created, the new habit then becomes an automatic reflex action, while the old habit becomes a thing of the past. Thank You to All of You!!!! At this point I want to sincerely thank all of you who have taken part in this challenge, whether by reading, by taking action in your lives, or by actively commenting and replying to the other participants in the daily threads. fufu/anonima, Bette/Swann, Maryna, Miss Elf, Lina, VickiB, AvocadoRulz, Maria, Glenn, Educate Yourself, Susan, Kristine, Ken, JadePenguin, Moonsparkle, Calae, and everyone else who has been a part of this challenge, thank you. Regardless of how many posts or how frequently you posted, all your posts made a difference for me and I’m sure for the others passively following and reading the challenge as well. Thank you. I want to especially thank those of you who actively participated by taking pictures of your meals, sharing updates on your diet / exercise / daily task posts in the daily posts, and responding to the other participants. Really, thank you. This challenge would have never been the same without your active sharing each day; your words and pictures make the challenge come to life. Like I mentioned on Day 6, a challenge without any engagement quickly becomes an empty challenge, and it’s very difficult for me to write subsequent tasks in a meaningful manner because I’ve no idea how you’re progressing. (If it isn’t obvious, I adapt every course and challenge to match participants’ consciousness and progress, even if it’s one I’ve done before.) You guys made all the difference for me. So, thank you! Congratulations fufu, I’ve already said this to you but I’m SO, SO happy for you!!! 😀 I’ve heard you mention so many times about wanting to gain weight but not able to, and to finally be able to do that now, because you were part of the challenge, is just amazing to me! I noticed that before the challenge I thought the main obstacle for me to live a healthy life was LACK OF CONTROL, now I know it was LACK OF INSPIRATION. I kept eating the same healthy foods every day for half a year (at least) and was so bored with their taste that I could not make myself eat them. During these 2 weeks, I brought back to my diets products I haven’t been eating for a long time. Today I am eating coconut for the first time in 2014 and 2015. When my diet is more diverse, I do not need to control and make myself eat healthy stuff. I enjoy it, and this is what I should do. I do not need to do the same intense workout every time, I can do something different (even if it is not that intense) and enjoy the freshness of the new experience I get. I say, “WORD Maryna!! !” If your diet / exercise regime is boring you, then perhaps it’s simply time to change things up, just like what Maryna did for herself in 14HLC! When there’s a lack of inspiration, it’s not about waiting for inspiration to strike; it’s about CREATING that inspiration OURSELVES! I ate very very little chocolate in the last 14 days. 🙂 I am capable of eating one chocolate or one box of chocolate cookies a day. In the last 14 days I did not have cravings for sugar and there was no need to resist chocolate since there was no need to eat it. It was effortless. I ate lots of fruits. I went on lunch out during work and ate in peace. I drank lots of water. I also did 13 of 14 challenge tasks (92.8 %); I missed day 8. This is the first time I really stuck to a challenge almost 100% and did the tasks although I (falsely) thought they would not be beneficial. [I learned that] I should be more specific with taking-a-walk goal — I should set an hour when will I go. Statistics in % gives me better insight into my performance (more objective and realistic), that way I can see how every single day is important. 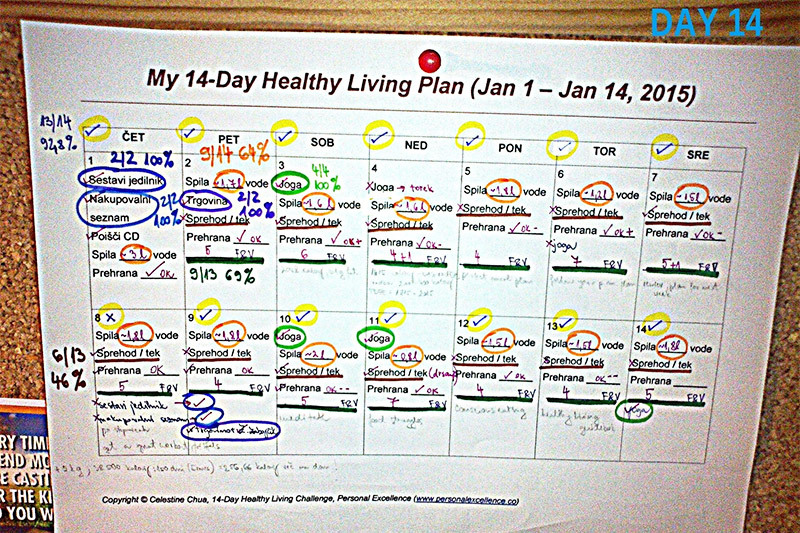 My motivation [during the challenge] was the printed 14-day healthy living plan, the printed meal planner, scheduling and keeping track, and commenting and sharing my results. Whoever you are, and whatever you’ve gained (no pun intended, fufu!) from the challenge, I want to thank you for being a part of the 14-Day Healthy Living Challenge. It has been my joy conducting this challenge, posting the daily tasks, supporting you guys, and working on my healthy living goals in the progress, and I hope this challenge has helped in one way or another in your healthy living goals. Now, as we wrap up the challenge, let’s move to today’s roundup task! What are the biggest things you’ve gained and learned for yourself from 14HLC? What has/have been the most helpful task(s) for you? Why? What would you like to see at PE moving forward? If you’ve found the 14-Day Healthy Living Challenge useful, then you should most definitely check out Live a Better Life in 30 Days Program and Be a Better Me in 30 Days Program. The former is my 30-day program to transform your life while the latter is my 30-day sister program to become the highest version of your self. Both are premium programs at PE that have transformed the lives of many around the world, and continue to do today. The tasks are timeless and can be done again and again (recommended once every six months to a year). In the meantime, I look forward to connect with you further on PE. 🙂 Subscribe to the FREE PE newsletter (where you get two of my free e-books, 101 Things To Do Before You Die and 101 Most Inspiring Quotes of All Time) and RSS feed if you haven’t already! Coming up on PE, I’ll be conducting an all-new soulmate course (a PE premium course) next month, February. I’m SUPER excited about this one guys as helping others find love has been a topic I’ve been passionate for a LONG time, being someone who was single for almost all my life and took a while to finally find my one. In fact, this was a course that I wanted to launch last year February but didn’t since I was busy with many other things, but this year, it’s definitely coming to PE. For those of you singles, and you’re serious about finding love, stay tuned for this course. I’ll be posting details nearer to the launch. Bid your farewells to the other participants!